WALLOPS ISLAND, Va., Sept. 19, 2012 -- Now deployed to the U.S. East coast, Northrop Grumman Corporation (NYSE:NOC) -built unmanned NASA Global Hawks will be able to better support environmental scientists during Hurricane and Severe Storm Sentinel (HS3) missions. The HS3 missions aim to study the processes of hurricane formation and intensity change in the Atlantic Ocean. The 2012 HS3 missions began earlier this month, marking the first time the unmanned aircraft were employed from NASA Wallops Flight Facility in Virginia, not from their regular base of operations at the Dryden Flight Research Center on Edwards Air Force Base, Calif. Additionally, this is the first time pilots have controlled the aircraft from two locations, from ground stations at both Edwards Air Force Base and NASA Wallops. "This year, we're utilizing two unmanned Global Hawk aircraft and flying them from the U.S. east coast rather than one Global Hawk flying from the west coast, as we did during previous NASA hurricane field campaigns," said NASA Scientist Dr. Scott Braun, HS3 mission principal investigator and a research meteorologist at NASA Goddard Space Flight Center, Md. "We're also flying new instrument payloads this year, which will sample the large-scale environment of storms to see if conditions are favorable for storm formation and intensification." NASA Wallops was selected as a deployment site because the area of scientific interest is the Atlantic Ocean, especially the eastern Atlantic where hurricanes begin to form. 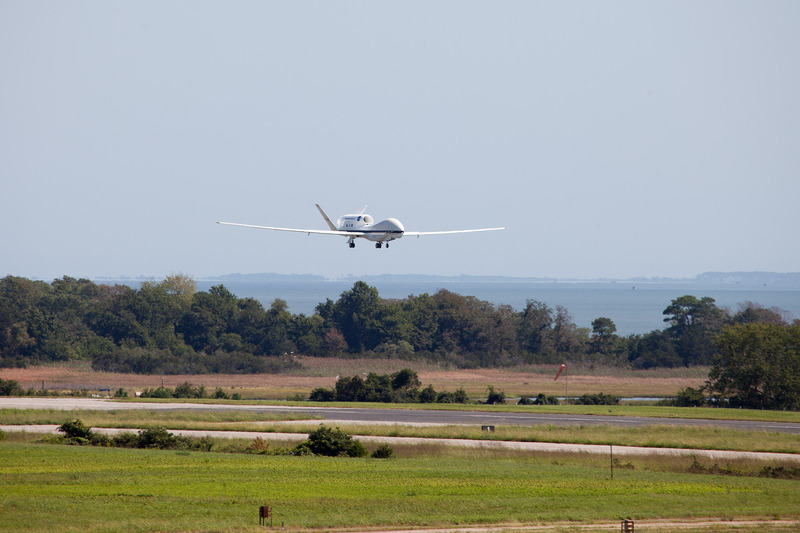 Although Global Hawks have flown over hurricanes in the Atlantic from NASA Dryden in California, flights from Wallops will travel further out over the Atlantic and collect data for a longer period of time. The long range, endurance and high altitude capability of the aircraft provide access to storms forming off the coast of Africa, and the aircraft can track the storms far into the Caribbean. Northrop Grumman is contributing pilots, mission planners, maintenance and engineering support at both Wallops Island and NASA Dryden for these important science missions. 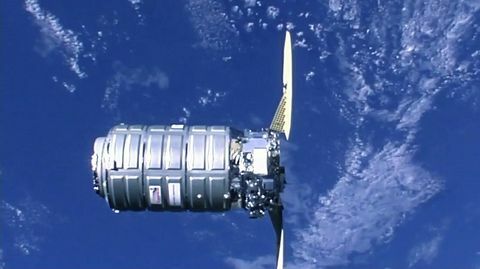 By operating as an integrated team with NASA, the flight operations have been controlled from both locations during these flights. 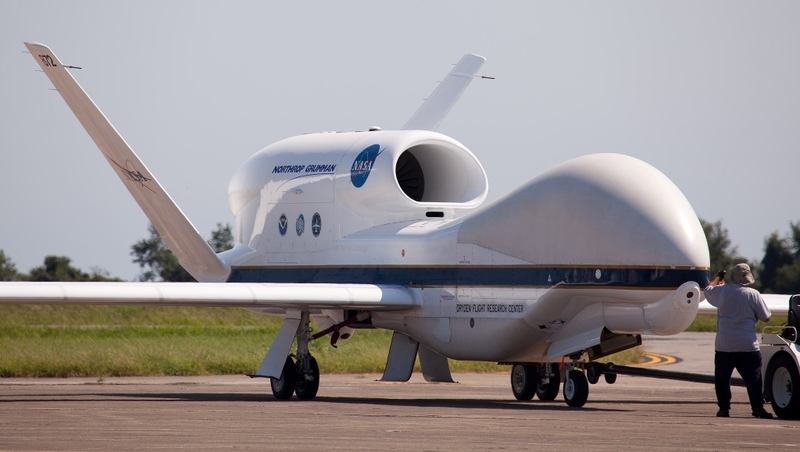 NASA Global Hawk AV-6 has supported flights and collected data over two hurricanes: Sept. 6-7 over Hurricane Leslie and Sept. 11-12 over Nadine. Flights will continue over tropical storms forming in the Atlantic and will employ the second aircraft later in the month. "Able to fly as high as 65,000 feet for periods up to 31 hours, Global Hawk provides the unique combination of high altitude and long endurance performance capabilities that allow the science community to study and deepen our understanding of how hurricanes form and what processes control their intensity," said Fred Ricker, vice president and deputy general manager for Advanced Programs and Technology for Northrop Grumman's Aerospace Systems sector. "Under our agreement, Global Hawk is able to meet many demanding payload and mission requirements, allowing it to host various instruments and sensors to conduct different science missions and research campaigns for both the NASA/NOAA science community and other Northrop Grumman customers." In 2010, NASA Global Hawk completed the first science research campaign called GloPac, studying the atmosphere over the Pacific and Arctic. 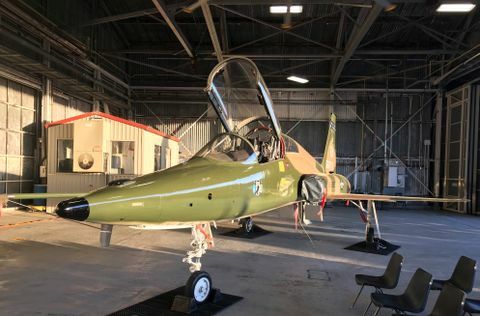 Later that year, the aircraft was used in the Genesis and Rapid Intensification Processes (GRIP) hurricane surveillance missions that provided extended monitoring of changes in hurricane intensity during five different storms in the southern Caribbean and western Atlantic. In the spring of 2011, NASA flew winter storm missions over the Pacific and Arctic, observing among other weather phenomena, an "atmospheric river," which sometimes causes flooding on the West Coast. In fall 2011, Airborne Tropical Tropopause Experiment flights over the Pacific studied the composition of the tropopause by climbing and descending between 65,000 feet and 45,000 feet.